Visit their Facebook Event Page and the website! 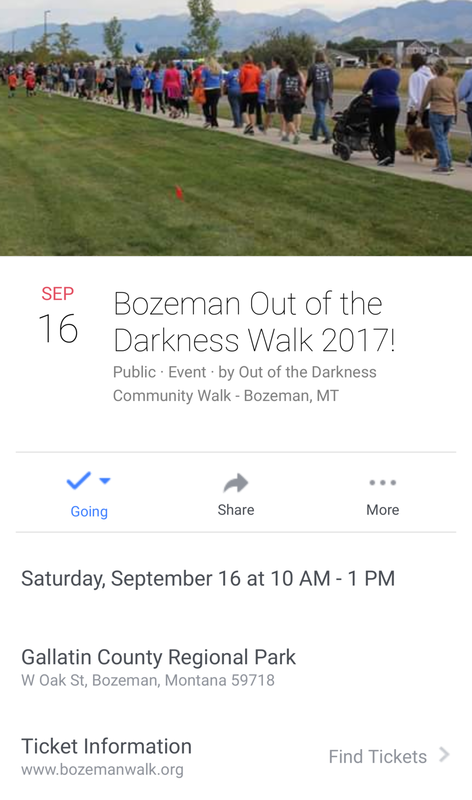 I am super excited to announce that on Saturday, Sept 16, I will be photographing the event for Out of the Darkness Bozeman Walk! I strongly believe that being mentally and emotionally healthy is very important! One of the many reasons I am majoring in psychology. I know many people who suffer from depression, anxiety, suicidal tendencies, as well as other mental illnesses. Unfortunately, it is a topic that isn't talked about enough. Growing up, they didn't really educate us about it in school. I really wish they had. The more people know about it, the more they can help others! If you're available that Saturday, I highly recommend you join us! The goal is to help raise awareness and funds that will allow the American Foundation for Suicide Prevention (AFSP) to invest in new research, create educational programs, advocate for public policy, and support survivors of suicide loss. If you're unavailable for the walk or to donate, please share this page!